Order now and receive free freight! Every Tapcon® is in stock for immediate shipping. 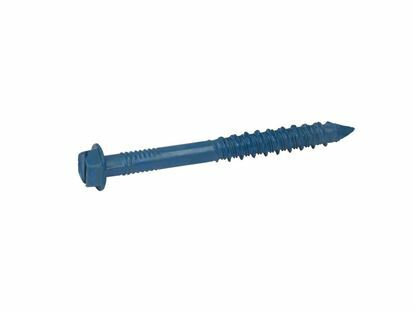 The design of the Tapcon® concrete masonry screw anchors allows for anchoring into concrete, brick and block. 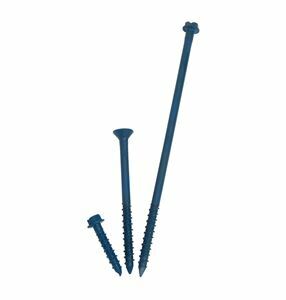 This American-made product is a self-tapping screw that taps threads into a predrilled hole in masonry materials. The patented Advanced Threadform Technology™ lowers installation torque to reduce head snapping, provide higher holding power and deliver the unparalleled performance that professionals expect. The Tapcon® concrete masonry screw anchors are uniquely engineered to provide easy installation and consistently high holding values in most masonry materials. Installation near the edge of concrete is possible because the Tapcon® concrete masonry screw anchors do not create an outward pressure from expansion. The Tapcon® brand of masonry fasteners are divided into five categories. These categories include the standard blue Tapcon®, the 410 stainless steel Tapcon®, the Large Diameter Tapcon, the special bits used in the installation tool kit and the tool kit. Into what environment will the Tapcon® screws be installed? For indoor dry applications where there is no moisture present. the standard blue Climaseal™ coated Tapcon® should be sufficient. For wet, moist applications, the 410 stainless steel should be considered. 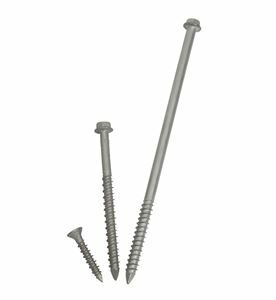 410 stainless steel Tapcon® provide the best rust resistant material for self-tapping masonry screws. The Tapcon® is not made from higher quality, more rust resistant stainless steel because the threads would be unable to harden to the correct hardness to tap masonry. 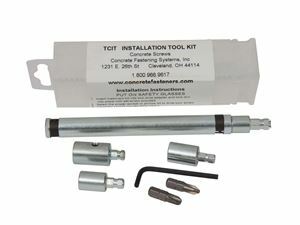 Tapcon® bits are the bits that come packaged with each box of 100 screws, and are also the bits that sold separately. These bits have a flattened end that goes into the installation tool kit to allow a set screw to be used to hold them in place. What is the size of the hole in the item being attached? The size of the hole in the fixture is important because, once in place, the screw must be inserted through the hole and into the concrete. The hole must also be drilled with the item in place. The standard blue 1/4" Tapcon® requires a fixture hole of 1/4"; the 3/16" Tapcon® requires a 3/16" hole in the fixture. The 410 stainless steel is different and requires a 5/16" hole for the 1/4" diameter, and a 1/4" hole for the 3/16" diameter. Large diameter tapcons require, in most cases, a 1/16" larger hole than the designated diameter. Does the head need to be flat with the surface of the item being attached? 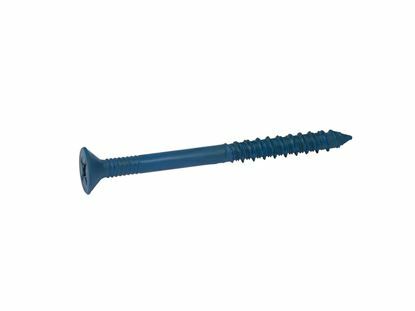 The hex head Tapcon® masonry screw, once installed, sits with the head above the surface of the material being fastened. If the application calls for the screw to sit flush with the surface, then the flat countersunk phillips drive Tapcon® should be used. 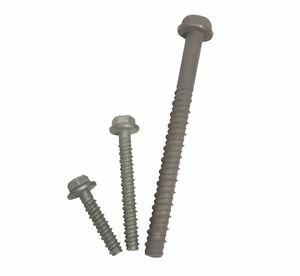 Tapcons® fasteners are considered a light duty fastener as compared to other types of masonry or concrete fasteners. The blue Tapcon® are only 3/16" and 1/4" in diameter compared to other anchors that may be 3/4", 7/8" or 1". The holding values of any blue Tapcon® are directly related to the quality/strength of the base material and to correct installation. Large diameter Tapcon are designed for heavier applications, and provide excellent holding values in both solid concrete and block base material. It is not recommended that the 5/8" or 3/4" large diameter Tapcons® be used in hollow block. The Tapcon® Installation toolkit is designed to allow the use of one tool for both operations (drilling the hole and driving the screw). Simply insert the installation tool shank into the Jacobs style chuck (the type of chuck that uses a key). Insert the drill bit and tighten the set screw. Drill the hole with the hammer drill set in the hammer and rotation mode. Take the sleeve and put it over the bit, lock it in place and drive the screw.